HighDesign 1.8 delivers enhanced compatibility thanks to the support of DWG™, more tools and a streamlined user experience for increased productivity. Ilexsoft today announced the release of HighDesign™ 1.8, a major update to their professional CAD application for architects, engineers, designers and home builders. 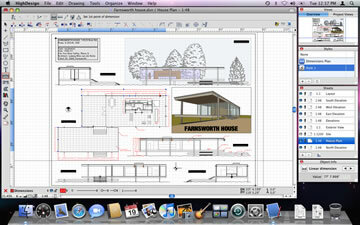 With over 50 new features and enhancements, HighDesign 1.8 is faster, easier to use and more powerful. For professional designers, HighDesign 1.8 Professional Edition provides support for the AutoCAD® DWG™ and DXB file formats from version 9 up to 2008, and offers advanced options to export the project as high-quality TIFF images. Both Standard and Professional editions now support DXF from version 12 to 2006. Printing now offers adjustable output resolution and the ability to print the grid. With the introduction of Styles and Presets, HighDesign 1.8 Professional helps designers better organize their projects and save time by condensing repetitive actions into one click. By saving a preset, current tool settings can be stored and reused every time it is needed, in any project. With the new Styles, it is now possible to organize project items by their properties and activate any tool with any set of properties with one click. HighDesign 1.8 delivers powerful new tools to let users create professional, standard-compliant projects in less time. Dimensions now provide options to adjust every graphical detail such as label offset, gaps and attributes, all in the current unit, making it easier to comply with international or company standards. Creating and editing annotations is now easier and faster. With the new Stretch tool, the user can now experiment new solutions by transforming any part of the drawing with just two clicks. Arrowheads and markers have been improved with the introduction of new types and adjustable size. Performance has been enhanced in HighDesign 1.8 so it’s faster to complete common drafting operations like redrawing, zooming, selecting, moving and transforming objects. Many improvements have also been made to the interface so to provide a more intuitive and accessible user experience.